Hello, how have you been? Pardon the almost 2-month absence from the blogosphere! I was revamping the whole website, including shifting the blog back to WordPress. This whole process took a bit longer than I expected, but I really like the new layout (and I hope you like it too!) There are still a few minor details I would like to tweak (like the recipe page) but those can wait, because I have so many backlogged recipes to blog about! 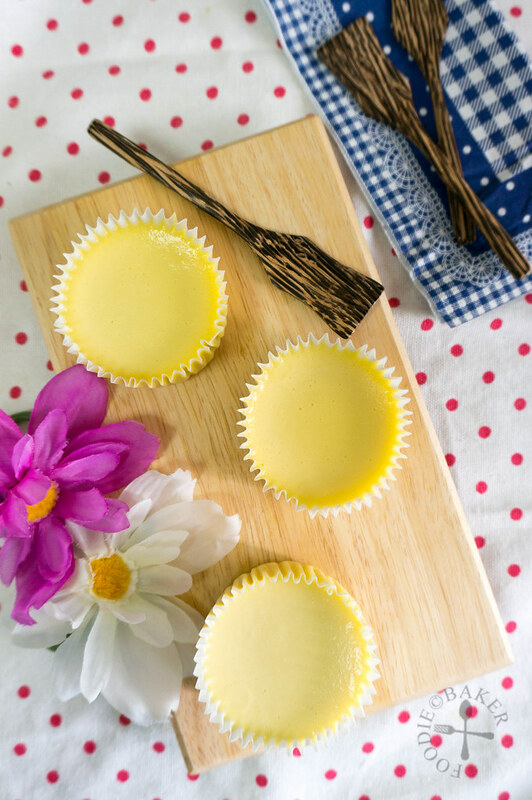 Recently I instagrammed a photo of a durian cheesecake and as promised – my comeback recipe! I’ve never really wanted to bake or cook with durians because I’ve always loved them pure and original. The only exception were the Crispy Durian Rolls I made last year. But since I got a packet of Mao Shan Wang durian puree a few months back during the durian season (they are kept frozen) – and each kilo cost only S$13! – I decided to bake something with it. If you love durians, you are in for a treat! 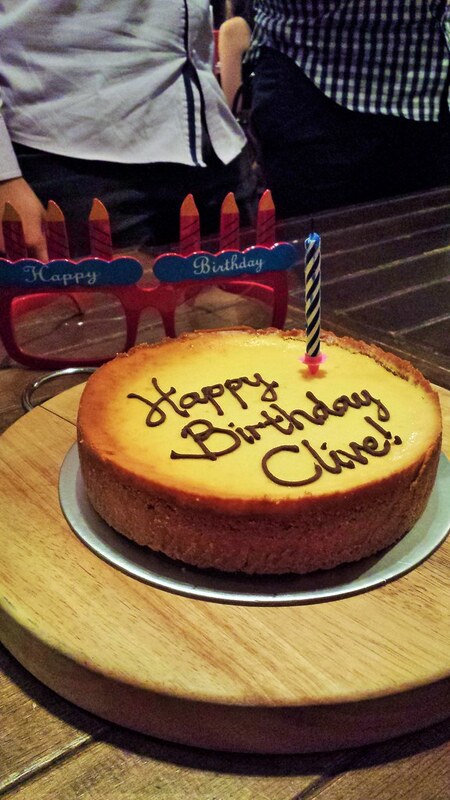 This currently ranks Number 1 in my cheesecakes list! I first baked some baby cheesecakes because they are easier to share with friends. 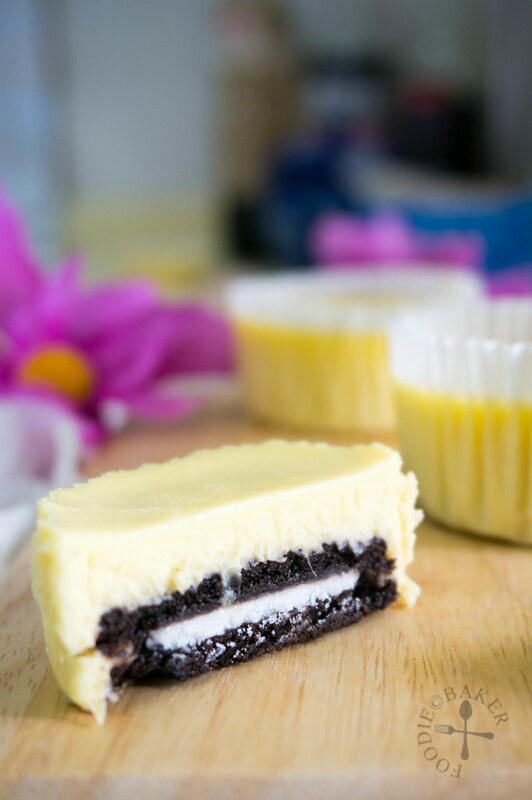 To save the hassle of making the crust (as I just wanted to see how it would taste like), I simply dropped a Oreo cookie into each muffin tin – but unfortunately I underbaked them so they were not very set. It’s good, but the texture was a bit too soft. Celebrating our friend’s birthday at a restaurant! The staff didn’t knew the cake was durian… oops! So for my second try, I rebaked the cheesecake, this time making a whole cake with a tall digestive biscuits crust (as this was my friend’s birthday cake) and baking it longer until the top is a little golden brown. I didn’t frost/glaze it because I didn’t want the frosting/glaze to overpower the durian, also, somehow I liked the rustic look of the browned cheesecake. The taste test was passed with flying colours – the restaurant staff who didn’t like durian was quite put off with the smell (she couldn’t figure out what smell that was ooops), but she still kindly divide the cake for us. 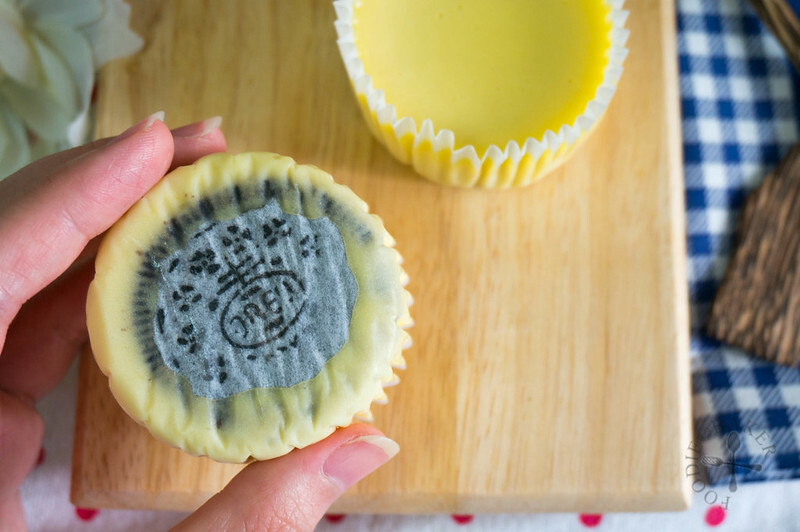 But for durian lovers like us, this cake is simply heavenly! The texture was just right and the taste of durian was so intense! Definitely a cake to impress and to please. 3) Beat in the eggs, one at a time, until fully incorporated. 4) Beat in the milk. 5) And the cornflour. 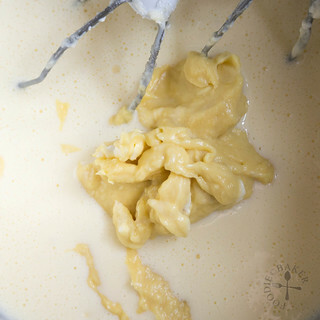 6) Add in the glorius durian puree! 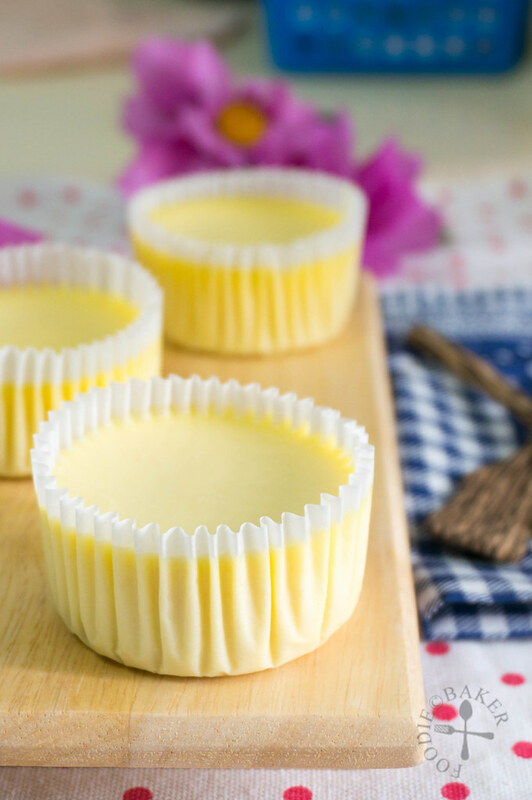 The quality of durian does make a difference in the taste of cheesecake, so use only the best durian possible! 7) Here's another shot of the yummy durian puree. 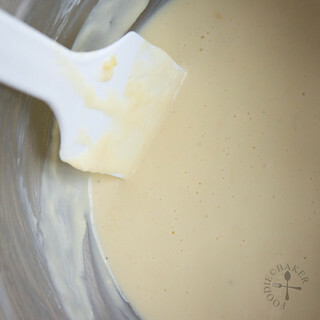 8) Beat on low speed until mixture is smooth. 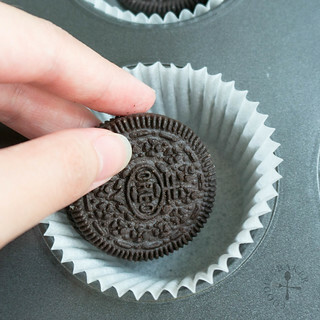 9) Place an Oreo cookie into each lined muffin tin. 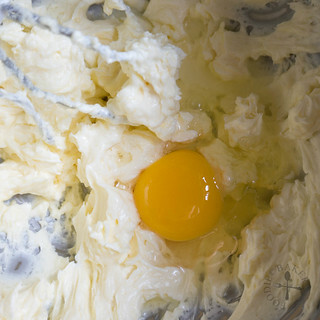 10) Pour in the batter and bake away! Preheat the oven to 175 degrees Celsius. 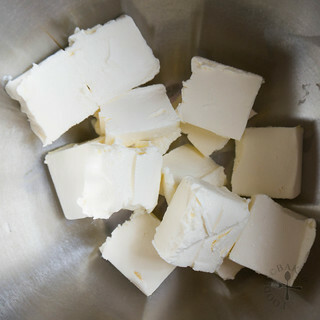 Lightly butter a 7-inch loose-bottom round baking tin and set aside. Combine the crushed biscuits and melted butter together and press into the baking tin, such that the crumbs come up to the side. Wrap the exterior of the tin with 2 layers of aluminium foil to catch any melted butter. Bake the crust for 15 minutes to set the crust. Using the back of a spoon, press the crust against the sides of the tin. Use a toothpick or skewer to poke holes on the bottom of the crust. Set aside to cool slightly. Lower the oven to 160 degrees Celsius. 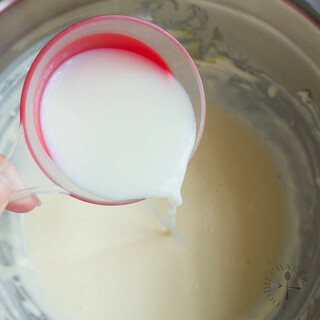 Place cream cheese in a large mixing bowl and beat on low speed for 1 minute. 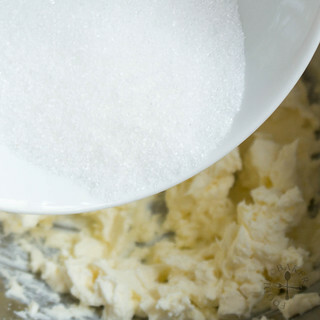 Add in sugar gradually and continue beating for 4 minutes, scrapping down the sides occasionally. Beat in the eggs, then milk, then corn flour, and lastly durian puree. 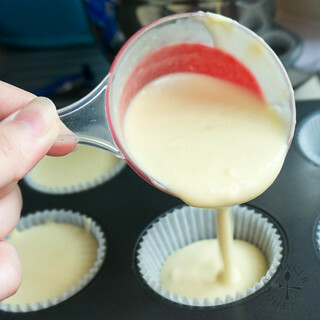 Pour the batter into the baking tin. Drop the tin several times on the table counter to release the excess air bubbles. Bake the cheesecake for 40 to 45 minutes until the cheesecake is set and the top is lightly golden brown. Let the cheesecake cool completely on a rack then refrigerate for at least 4 hours or overnight. Run a knife along the sides to loosen the cheesecake. Lift out the cheesecake and serve! A little late here, is “corn flour” here means cornstarch? Now we just need a vegan organic raw fair’trade frugivore cheeze cake, mmm! ciao, thank you / kind regards, Hannah, MsHJB*, VORFFs. Hi Syuen, use both top and bottom fire! hi, i was wondering what kind of milk should i get for this recipe? full milk , low fat ? sorry, i’m new in baking..
Hi Azlina, no worries at all! 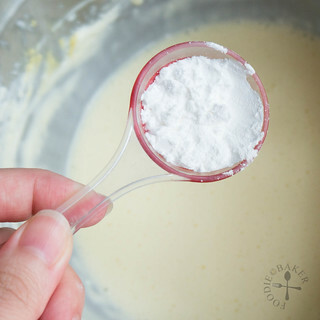 I always use full-fat milk in my baking/cooking, but for this recipe, as the amount of milk used is not a lot, both full-fat and low-fat milk will work, just use whatever you have on hand, as long as it’s not chocolate milk or strawberry milk 😉 Happy baking! Hi Jasline, I was wondering can you possibly change the measurement to cups and mL? I have don’t a scale at home. Hi Isabelle, sorry for the late reply as I’m away on a holiday. Please use TraditionalOven for the conversion, that’s what I use whenever I convert the recipes. Hi Jasline, Can I know how you puree the durian? Would love to try the recipe! Hi Kitty, I got the durian puree from a seller at Ghim Moh Market (not sure if he’s still selling there), so I just use as it is. They are simply durian flesh from very ripe durians. 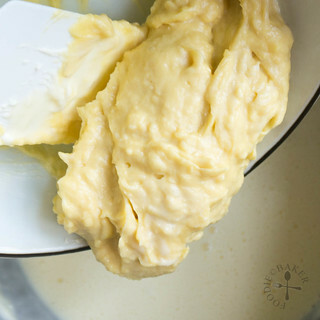 You can make your own by peeling the durian flesh off the durian seeds, and if they are not smooth, process them in a food blender with a little cream to make a smooth consistency before using. Hope this helps and hope you like the recipe! It’s a “killer”, so don’t bring this to restaurants like what we did hehe. 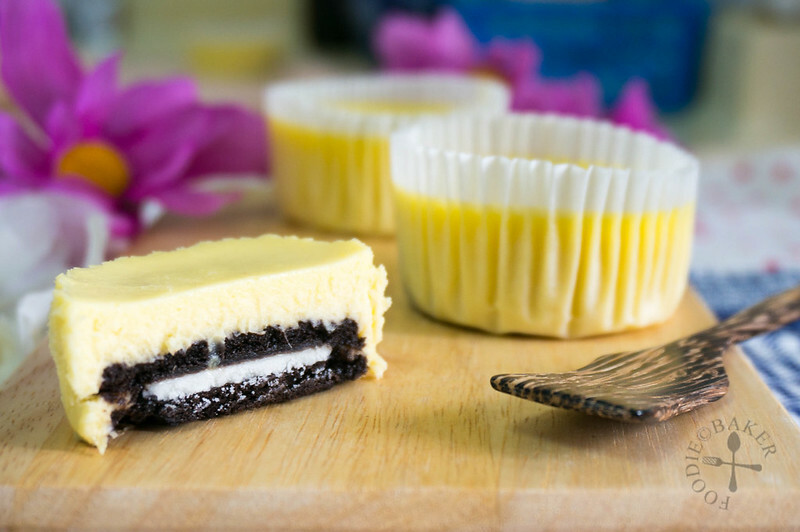 This is a wonderful idea, I would not have occurred to try it but I promise I love Cheesecake. And the Photos is great. Hi Magdalena, thank you for your compliments! Have you tried durian before? Do you like it? Durian really has a bad rap, I have never smelled it or tasted it’ After seeing the episode of Andrew Zimmern and his run in with durian it scared me. Must say your cheesecakes look wonderful, durian may not be easy to find here in NYC but I could always sub puree of another tropical fruit. Beautiful recipe. I was thinking it would be nice with papaya or guava. Will let you know. Interesting! But papaya have a lot of juices, may have to drain them before mixing it in… can’t wait to see your cheesecake! Yes… you will love it if you are a durian lover! Welcome “home”, Jasline! I’ve seen durian in the markets but pass it by, knowing its foul-smelling reputation. If I can find durian puree, perhaps I’ll give your cheesecake a try. Welcome back Jaseline, missed your posts already. The cheesecake looks cute and sounds yummy! Hi Daniela, thank you so much for your kind words, I’m really touched 🙂 I hope you like durian! Thank you so much my friend! 🙂 Love your avatar, so cute! Yes I hope you will love durian, it’s one of my favourite fruits!